Make in India. It’s one of Narendra Modi’s signature policies - trumpeted by the prime minister to both domestic and foreign audiences, and exhaustively promoted by his government with savvy marketing campaigns. Its chief symbol - a stalking lion comprised of cogs and wheels - has become ubiquitous across India. Contrary to what its name may suggest, Make in India is not a protectionist policy in line with the inward-looking thinking that’s fashionable in many parts of the world these days. On the contrary, it is unabashedly global: A message to the world’s top companies to bring their capital, technology, and production capacities to India to help transform the world’s second-most-populous country into a global manufacturing hub. If successful, Make in India could produce welcome impacts for the nation’s economic, political, and defence realms. India’s economy has achieved marvellous growth over the last few decades, surviving several shocks that include the 2007-08 global financial crisis—a period when Indian GDP grew by more than 6%. However, it’s slowed in recent months, with growth of only 5.7% between April and June; the lowest rate since early 2014. This slowdown has been attributed to a demonetisation plan that outlawed most of India’s cash, and to production cuts by Indian companies to adjust to the country’s new goods and services tax. Additionally, the labour market has long been a concern for the Modi government; as far back as 2015, less than a year after Modi became premier, India was experiencing considerable slowdowns in employment generation. According to one estimate, India lost 1.5 million jobs over the first four months of 2017. 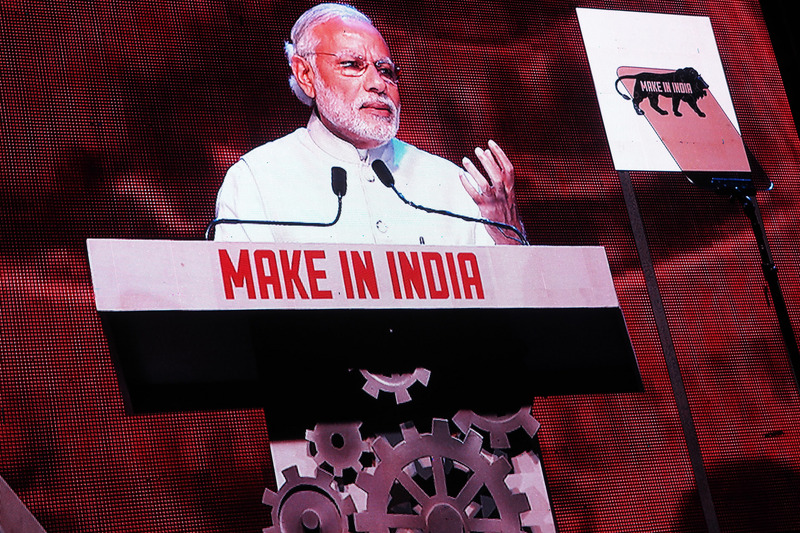 Enter Make in India, meant to stimulate jobs and the broader economy. The policy aims to help Indian companies grow by partnering them up with global behemoths to collaborate on production. The hope is to generate more jobs for India’s young, 1.2-billion-strong population and to develop a robust manufacturing sector - a part of India’s economy that hasn’t achieved the same soaring global successes as its services industry. A major focus of Make in India is defence - as evidenced by India’s new push to recruit global defence manufacturers to co-produce tens of billions' of dollars worth of advanced weaponry with Indian partners. India’s military is no slouch; it boasts the world’s third-largest army, and no other country in South Asia can hold a candle to its firepower and clout. Still, despite several years of modernisation, India’s military lags behind that of China, its chief strategic competitor. Additionally, it has long been hobbled by an inefficient defence procurement process that results in lengthy delivery delays and ageing, poorly maintained equipment. Make in India aims to change all this by recruiting the world’s top defence firms to help less experienced domestic companies do their jobs better. In effect, the policy intends to transform India’s defence industry by boosting capacities and bringing down costs - with the ultimate goal of better arming the Indian military with the best technology and weaponry that money can buy. These economic and defence triumphs could bring major political boosts to New Delhi, and particularly to Modi. National elections are less than two years away, and the premier remains a popular figure. A year ago, a Pew poll found that 8% view him favourably. Last month, an India Today Mood of the Nation survey concluded that nearly two thirds regard him as 'outstanding or good'. Still, Modi is far from invulnerable, and particularly given the country’s economic struggles. Ominously, back in 2015, 500,000 members of the middle-class Patel clan - one of Modi’s key support bases - took to the streets to demand employment. Jobs are a tried and true formula for delivering votes, so if Make in India can bring its much-ballyhooed employment bonanza, Modi’s prospects in the 2019 elections could shift from strong contender to virtual shoe-in. His political fortunes could further strengthen if Make in India nets prominent deals with the world’s big defence players. Many Indians want their military to be stronger, in order to better project power and raise the country’s global stature. To be sure, getting Make in India to succeed will be no cakewalk. The biggest challenge is getting the companies to come. Despite Modi’s pledges to improve India’s investment environment, many foreign financiers remain wary. India is ranked 130 out of 189 countries in the World Bank’s latest (2016) annual Doing Business report - an improvement of only four places since 2015. Strikingly, in the category of contract enforcement, it is ranked 178th. There could also be obstacles posed by foreign companies demanding more control and ownership (relative to local partners) in co-production arrangements than New Delhi is willing to give them. Ultimately, for Modi and his government, much will be riding on the performance of Make in India - a quintessentially big-ticket, high-stakes policy initiative.